Mind controlled games and gadgets are the new wave of the future. Using brainwaves and biofeedback these devices may be all fun and games for now but they are seriously a sign of what’s to come in entertainment and useful everyday products. 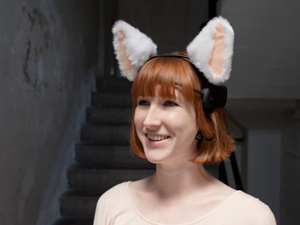 Watch the video below and check out the Brainwave-Controlled Kitty Ears for more. Filed Under: Nation of Billions Tagged With: biofeedback, brain, brainwaves, change, Chaotic Moon Labs, computer, creative, data, device, drum machine, EEG, experimental, FUN, future, gadget, game, geek, headset, information, mind control, molly wood, Necomimi, nerd, Neurosky, product design, sensor, shift, skateboard, society, software, technology, thinking, toys, u.s.